This artist’s impression shows the view from the surface of one of the planets in the TRAPPIST-1 system. At least seven planets orbit this ultra cool dwarf star 40 light-years from Earth and they are all roughly the same size as the Earth. Image: ESO/M. Kornmesser/spaceengine.org. The planets were discovered in the TRAPPIST-1 system by a team led by Michaël Gillon, of the University of Liège in Belgium. 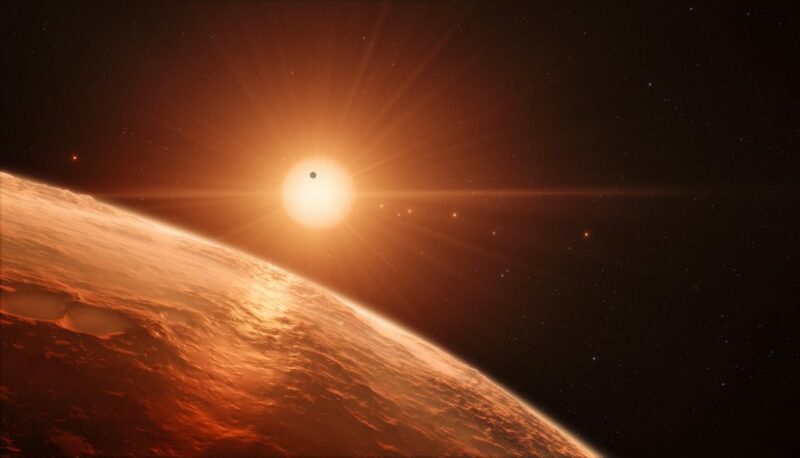 TRAPPIST-1 is named for the TRAnsiting Planets and PlanetesImals Small Telescope, which is actually two 0.6-metre telescopes located in Chile and Morocco that together monitor 60 ultracool dwarf stars and brown dwarfs, looking for evidence of exoplanets. Three of TRAPPIST-1’s planets – b, c and d – were discovered using the TRAPPIST-South telescope in Chile by Gillon and his team last year. 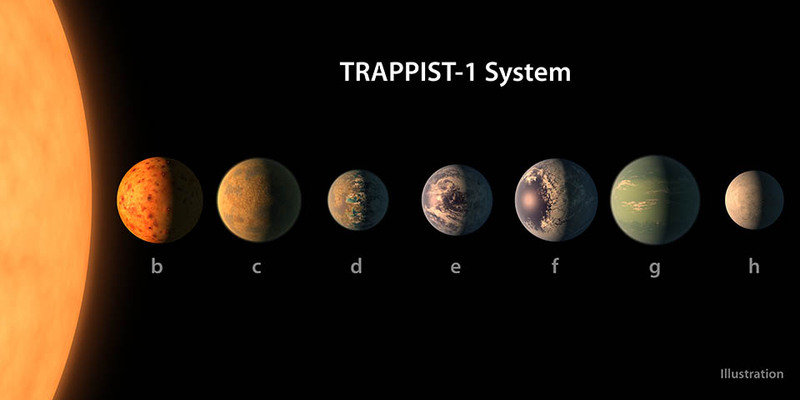 The additional four new planets make the TRAPPIST-1 system the first planetary system known to host so many Earth-sized worlds, not to mention potentially habitable worlds. All seven planets transit their star; that is, they cross in front of the star’s disc, blocking some of the starlight. The amount of light each planet blocks tells us their diameters, and how regularly they transit tells us their orbital period, from which we can calculate their distance from the star. Their masses are then determined by judging how big a wobble the planets’ gravity induce in the star’s rotational motion. The star, located in the constellation of Aquarius, is tiny, barely larger than Jupiter with a mass just eight percent of the Sun. Its surface temperature is a relatively cool 2,270 degrees Celsius, which is less than half the surface temperature of our Sun. 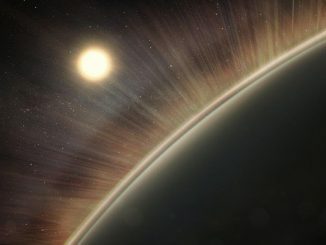 Consequently, the planets need to be extremely close to their star in order to receive enough heat to potentially have liquid water on their surfaces. This artist’s concept shows what each of the TRAPPIST-1 planets may look like, based on available data about their sizes, masses and orbital distances. Image: NASA/JPL-Caltech. “Fortunately, it seems that this kind of compact configuration is just what we see around TRAPPIST-1,” says Amaury Triaud of the University of Cambridge, who participated in the research. Indeed, the planets are located just a few million kilometres from their star and complete one orbit in a matter of days. The innermost six planets (the orbit of the seventh planet remains inaccurately known until more data is collected) also orbit in gravitational resonances with each other. For example, one planet may orbit twice for approximately every three orbits that its neighbour makes. This suggests that the planets formed further out before migrating inwards and becoming trapped in these resonances. The most likely of the seven worlds to be habitable are planets e, f and g, which lie in the middle of the star’s habitable zone. The three inner planets b, c and d are possibly a little too warm, like Venus, whereas the outermost planet, h, might be too cold. However, a thick hydrogen-rich atmosphere and heat induced within planet h by gravitational tides from the nearby star might keep it just warm enough for liquid water. 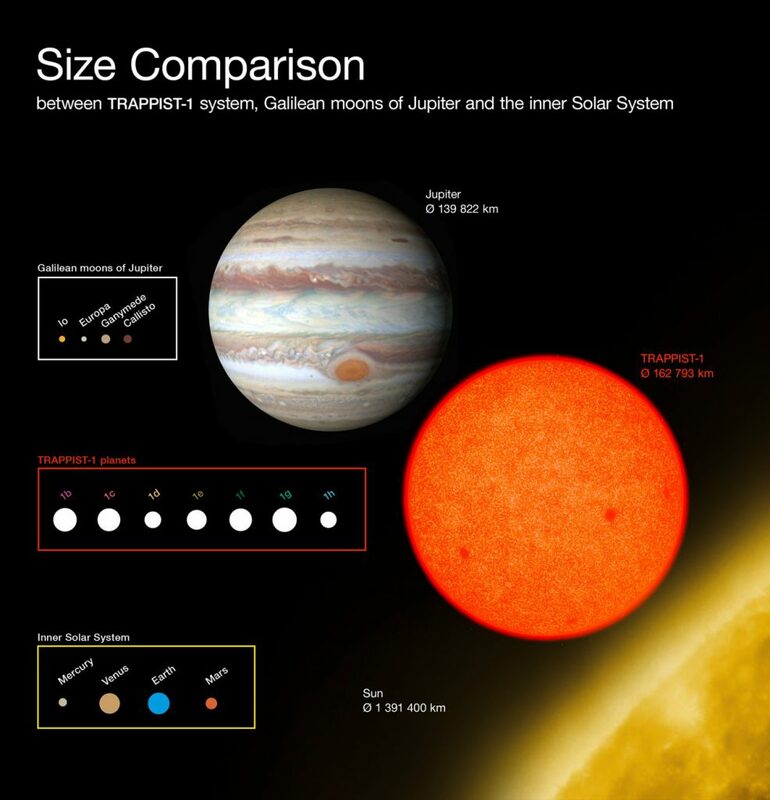 This diagram compares the sizes of the newly-discovered planets around the faint red star TRAPPIST-1 with the Galilean moons of Jupiter and the inner Solar System. All the planets found around TRAPPIST-1 are of similar size to the Earth. Image: ESO/O. Furtak. 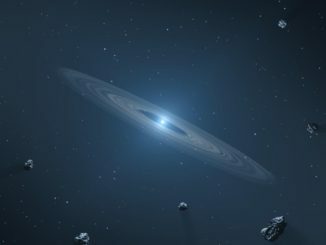 Although the current data, which is limited to telling us the size, mass and distance from the star of the planets, is not sufficient to reveal whether any of the seven worlds really are habitable, the Hubble Space Telescope is in the process of searching for atmospheres around these planets. Yet even if Hubble doesn’t succeed, other telescopes might. “With the upcoming generation of telescopes such as the European Extremely Large Telescope and the James Webb Space Telescope, we will soon be able to search for water and perhaps even evidence of life on these worlds,” says Gillon’s colleague, Emmanuël Jehin of the University of Liège. This diagram shows the relative sizes of the orbits of the seven planets orbiting the ultracool dwarf star TRAPPIST-1. The shaded area shows the extent of the habitable zone, where oceans of liquid water could exist on the planets. The orbit of the outermost planet, TRAPPIST-1h, is not well known at present. The dotted lines show alternative limits to the habitable zone based on different theoretical assumptions. Image: ESO/M. Gillon et al. 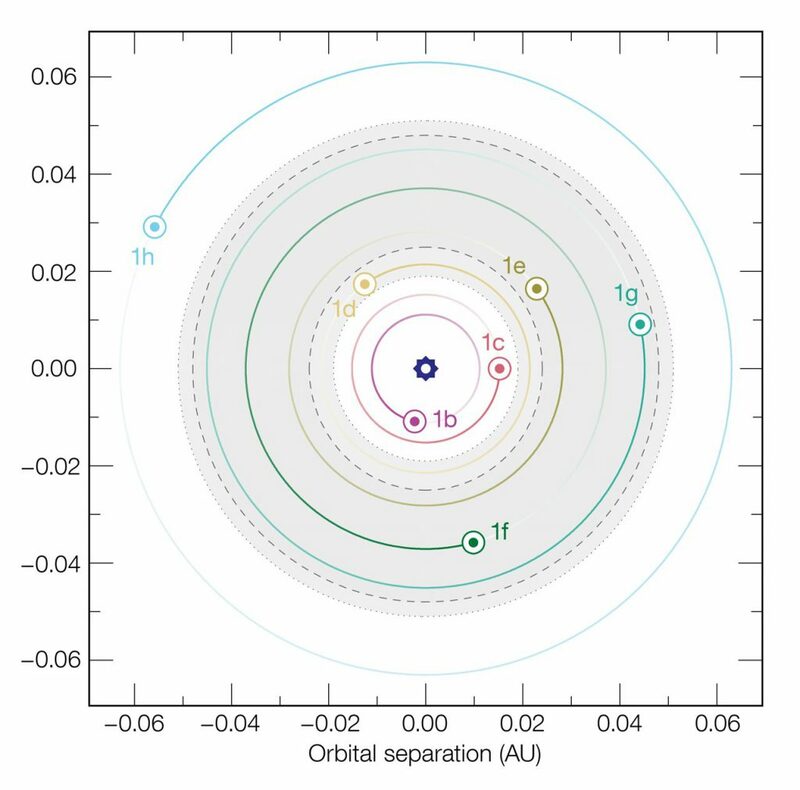 Following the initial discovery of planets b, c and d in 2016, a host of ground- and space-based telescopes, including NASA’s Spitzer Space Telescope, the Very Large Telescope in Chile, the William Herschel Telescope in La Palma and the UK Infrared Telescope in Hawaii, helped confirm the existence of the additional four planets e, f, g and h. The findings have now been published in the 22 February issue of the journal Nature. Analysis of more than two dozen relatively nearby solar systems shows the elements that went into their construction are broadly similar to what is found in Earth’s solar family, increasing confidence that Earth-like exoplanets may be common. 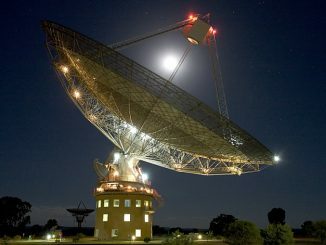 Breakthrough Listen, the 10-year, $100-million astronomical search for intelligent life beyond Earth launched in 2015 by Internet entrepreneur Yuri Milner and Stephen Hawking, has just announced its first observations of newly-discovered Earth-size planet Proxima b orbiting the nearest star to the Sun using the Parkes Radio Telescope in New South Wales, Australia.